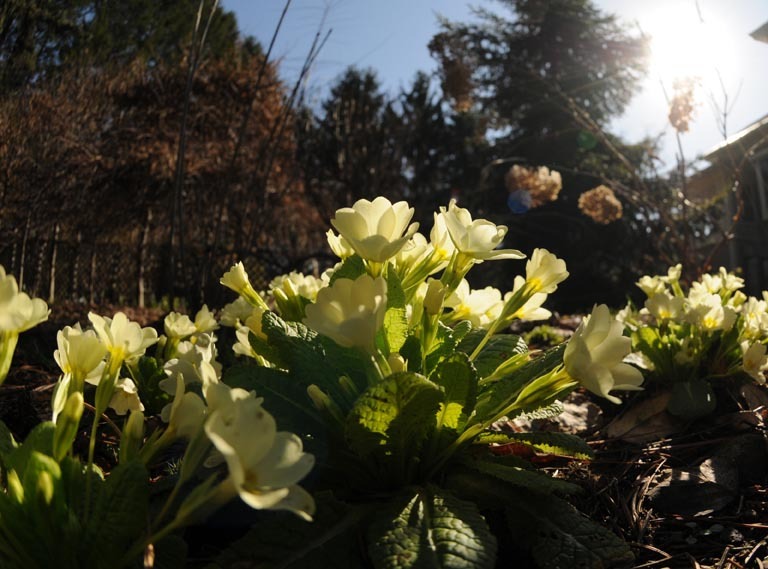 This Primrose is not rare, but it is more unusual in American gardens.Highly esteemed by British Primulaphiles, this ornamental primrose has a strong base of enthusiasts who strive for perfection with such things and a perfect gold edge that splits each petal, so that the blossom looks as if it has 10 petals and not five ( which this does), a good distribution of color that is nearly black (which this one has) and a thrum pistol, and not a pin ( oops..) (crazy American!). 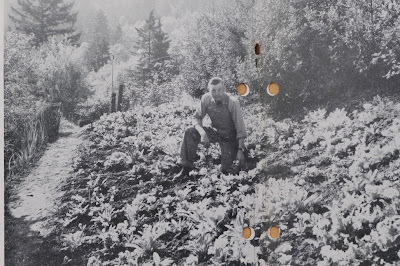 Pins and thrums are a constant worry of real primula enthusiasts, for in England, if you enter a pin flowering primrose in a primrose show, it is automatically disqualified ( a pin plant is one where the pistol extends out of the tube, see my flowers above). In England, these plants would be burned, or at least, banished to the far corners of the garden as punishment for not being perfect. Here in America, we worry less about such natural things, and who knows, I may even enter this in our National Primrose Show this Friday. Oh, wait......John Richards the Primrose expert is coming here for a cocktail party on Friday, I had better hide it! 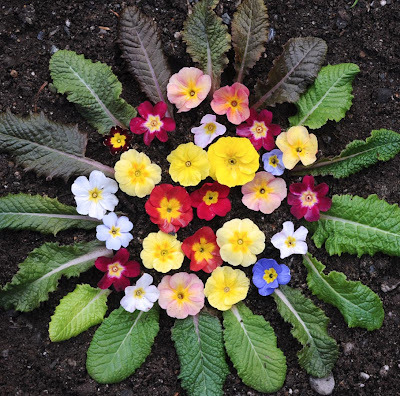 I picked a selection of my Barnhaven Polyanthus Primroses and arranged them in a homage to a 1950's American Primrose Society Quarterly cover that I saw in our bookcase. In the world of Primrose culture, the name Barnhaven carries as much cache as the name Gucci or Versace does in Fashion. Or, more accurately, when one grows primroses from Barnhaven seed, or obtains Barnhaven plants, it' the same thing as buying an outfit at a couture Milan Fashion house. So today, I am remembering the heyday of Primrose mania, in the United States during the 1930's and 40's, inspired by my Barnhaven seedlings. 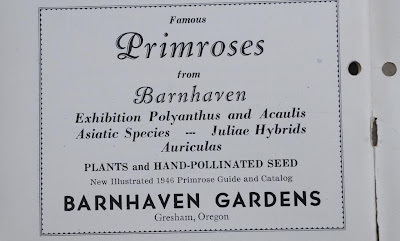 A 1946 ad for the original Barnhaven primroses. 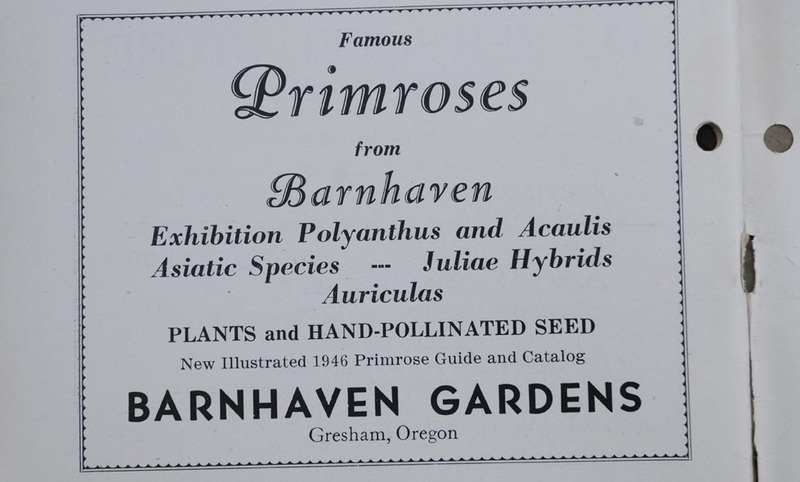 Simply said, Barnhaven equals provenance, for the breeding lines can be traced back to 1935 when the tiny nursery founded by Florence Bellis in rural Oregon during the depression. Last Year, when the current owners of Barnhaven visited our gardens during the American Primrose Society National Show, they shared some seed with us from their specialized collections of Polyanthus primroses. Today, anyone can order these most exclusive of primroses, but only from the source, Barnhaven Primroses. 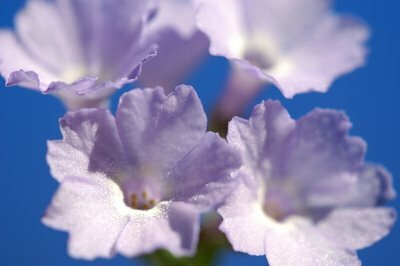 My seedlings are starting to bloom, and are very choice and beautiful, but the back story of this famous line is even better. The common yellow Primrose, or Prima Rosa ( early rose) , the early medievil latin name from which the Primose get's it's name, is one of the first wild flowers in much of Europe. These Primula vulgaris plants in my garden are seed grown plants that I had sown last winter ( winter 2008-09) and which I grew all summer last year, transplanting them in the autumn where they settled in for their first winter out-of-doors. This spring, an unusually early and wet one, has coaxed them into bloom about 3 weeks earlier than their more typical May 1st period of bloom. Primula auricula are spring blooming primroses that are hardly ever seen at garden centers or in mail order catalogs. 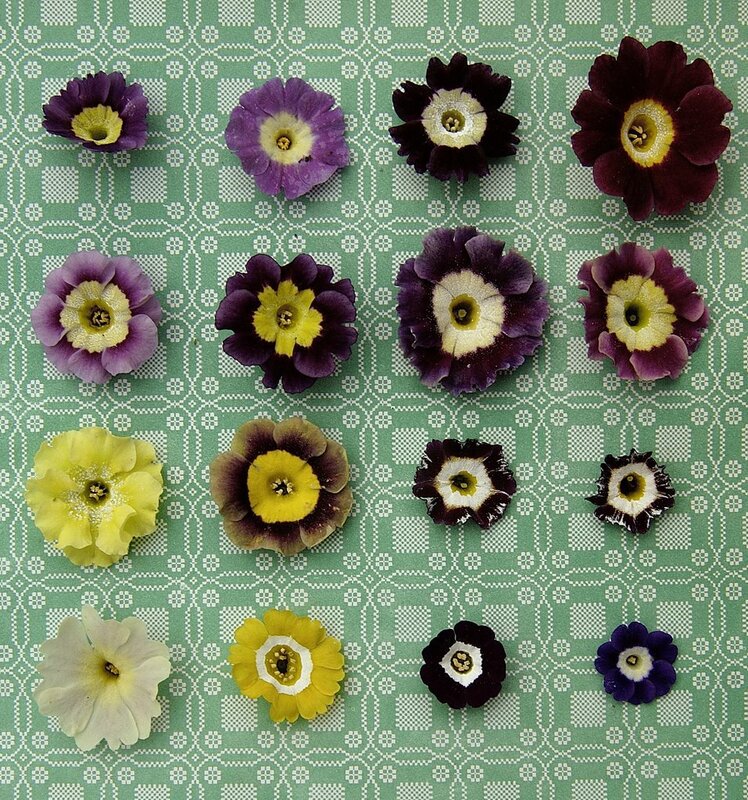 Over the years, I have been able to assemble a collection of various vintage forms of both types of P. auricula, tha types known as Show auricula, with thier paste-ringed eyes, so cherished by the Brit's in eitheenth century England, and the type more easily grown in well-drained locations, the Garden Auricula, with a darker palette and no white farina on the blossom. Just for fun, and in case I write a book on this sort of hobby of collecting rare plants that are out of fashion, I assembled this grid of blossoms to demonstrate the diversity in this one species. Shot on a vintage piece of paper that lined a book from the 1800's. 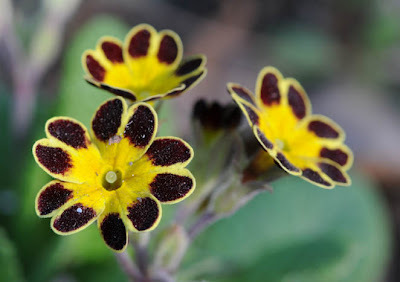 Primula marginata are primroses that you will not find at a garden center. 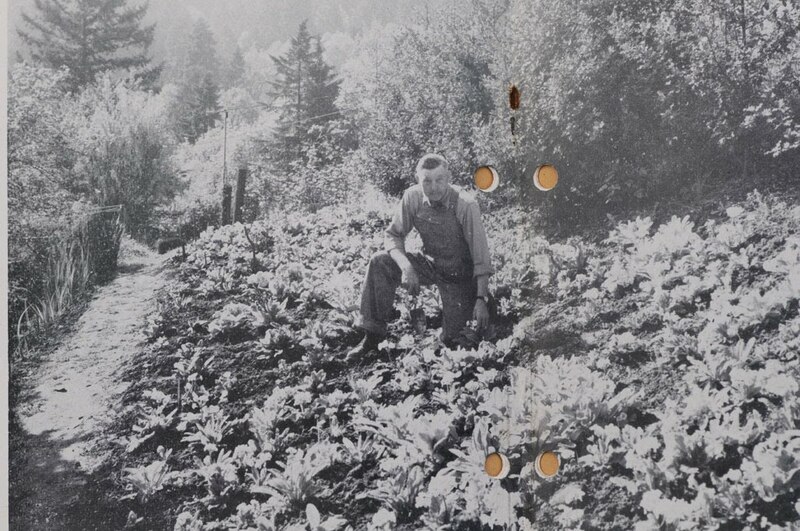 They must by ordered from an alpine plant catalog, or grown from seed, but that is even more difficult. Actually, the plants themselves are just plain difficult to grow,at least for me, but are a nice challenge for someone who can give them the right conditions in which to grow them. In my New England garden, I am trying some outside now, in the new crevice garden, where I can plant them between the tight rocks and give them a little overhead protection from the rain, but ideally, they need to be grown under glass, in a cold alpine house. Primula marginata have interesting dentate leave edges, with a distinctive white 'farina' covering the surface of the entire plant, even the blossoms have some. This protective coating is natures way of keeping moisture in, during high elevation squalls and winds, as well as protecting the plant from the radiation of the sun, the surface does give it a nice silvery appearance, but can be damages with careless watering or even rain. In the alps, they grow in the highest of elevations, over 10,000 feet where cloud mists and snowmelt seeps give them the fresh moisture which they need, and as well as cold fresh air, and no rain at all on the foliage. Just dry snow. 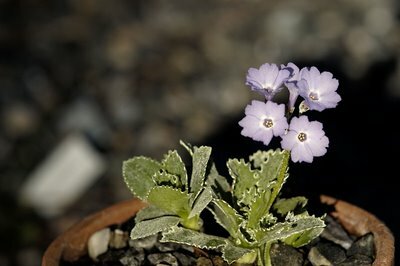 These high alpine primula are precious and still rewarding to grow, even if you kill the plant, as I do, every other summer or so!